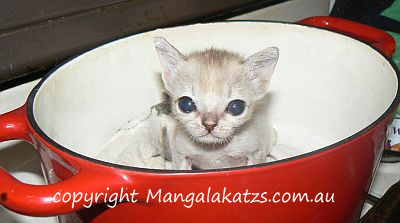 Searching for Singapura cat breeders? This page is build for these breeders to tell about themselves. Do not buy your Singapura in a pet store. It is likely that they come from a "kitten mill" which means breeding too many cats too often in too crowded conditions. Not to mention not sozialicing the kittens properly. It is very important that the kittens are old enough, preferably at least 12 weeks of age, before they are adopted. This is the only way to be sure they know "how to be a cat". Also it is important the kittens have been vaccinated, and that you get the proper papers for your new family member. Do not buy a kitten without papers. If the cat is not meant for breeding, it makes everyone's life easier if it is neutered / spayed before moving to its new home. And remember - when it comes to Singapuras, they adapt very well to new circumstances and are quite willing to adore new people, and so taking a slightly older Singapura is a very good option too! Be prepared for a little questioning when you contact Singapura cat breeders - they want to know where the precious little kitten is going. Singapura breeders will be listed here according to country and region, in alphabetical order. If you are a Singapura breeder, and wish to add your information, use the form at the end of the page. Tell Us About Your Cattery! 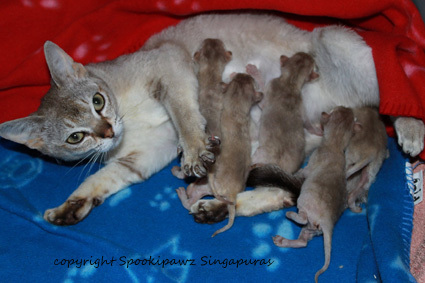 Are you a responsible Singapura breeder? If so, let us know about you. Answer the questions below and add up to four pictures of your beloved Puras. You will be building a real page about your cattery on this site. Include your link - I shall check your site (to avoid spam and to check you have a real Singapura cattery) and then put your page live on cat-breeds-info.com. Then I shall add a link to the list of Singapura breeders (above) which will direct the reader to the page you build using this form. I shall also put your cattery link live on your page for the visitors to click.